Amid all the news and rumors circulating in the android community, this is the best that could be of any interest to an iOS user. 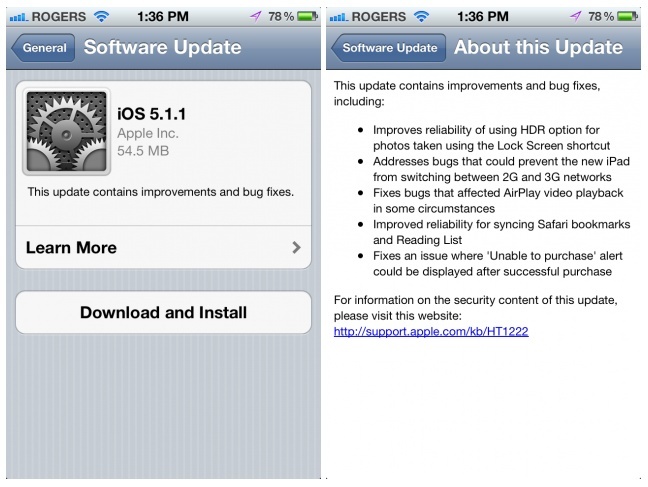 Apple has released a bugfix update for the iPad, iPhone and iPod Touch,thus increasing the firmware version to 5.1.1. The update takes care of some outstanding issues that either went overlooked or debuted in 5.1 which meant that they didn’t went much testing hence the reason for the bugs in it. These bugs include the ones involving HDR photo taking and AirPlay video playback. If you already have iOS 5.0 or above running on your Apple device , you can go to Settings/About/Software Update to download the file over the internet and update your firmware. If not, you have to connect your Apple device to your PC and update its firmware through iTunes. However, Jailbreakers should stay away from the update for now at least but according to some reports, the new software can safely be jailbroken (tethered) by using last month’s redsn0w. This minor update addresses a number of bugs in the iOS and brings multiple improvements to its features. To begin with, the bugs encountered while switching network between 2G and 3G with the new iPad have been squashed, as well as a bug that affected AirPlay video playback in a few situations. Also, a glitch affecting HDR photos when using the lock screen shortcut has been fixed. Other changes identified in the changelog include the removal of a bug that prevents Safari from syncing bookmarks and Reading List , and a glitch that often occurred while purchasing software from the App Store. This is just about all that iOS 5.1.1 will add to your Apple device. Nothing brand-new but as the rule of the thumb goes, having the latest firmware installed on your device is always a good thing. The iOS 5.1.1 is just about 50 megabytes in size, so it should not take too long to download and install.